The governor released his state budget proposal last week calling for $34.4 billion for FY 2008-09, an increase of 9.3 percent from the previous biennium. The administration’s budget recommendations for transportation total $4.2 billion, an increase in spending of about 4 percent from FY 2006-07. 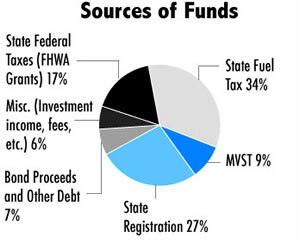 This amount accounts for revenues from all sources, including state vehicle registration fees, state gas taxes and federal grants. 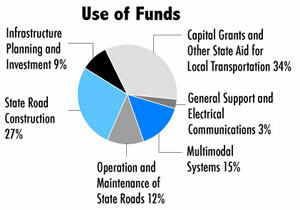 The state transportation budget supports not only Mn/DOT, but also local governments and the transportation needs of other agencies. Programs include the design, construction, maintenance and management of state highways and bridges; financing of county and municipal state aid roads; funding for Greater Minnesota transit operations, and the development and maintenance of airports, freight and commercial vehicle operations, and traffic safety. Mn/DOT will present the governor’s budget request to the Legislature on Feb. 27 and March 1. Part of the administration’s transportation budget recommendation includes a $1.7 billion bonding program that would accelerate more than two dozen high priority state highway projects years ahead of their original schedules. Financing and accelerating more than 25 high-priority state highway construction projects through a $1.7 billion, 10-year bonding program. Debt service will be paid with new monies available through the recently passed state constitutional transportation amendment. Establishing a formula to distribute motor vehicle sales tax revenues, with 60 percent allocated for state and local roads, 38 percent for Twin Cities metro area transit and 2 percent for Greater Minnesota transit. Treating revenues from the sales tax on leased vehicles the same as motor vehicle sales tax revenues, i.e., using the same distribution formula to state highways, local roads and transit. Making a one-time $100 million general fund appropriation for state highways. This will supplement statewide funding for the FY 2008-09 state road construction seasons and provide $5 million for a pilot project to promote mileage-based transportation user fees as a replacement of the current gas-tax based transportation funding system. Exempting Trunk Highway Fund expenditures from the state sales tax. The proposed accelerated projects are estimated to cost $1.3 billion—about half for Greater Minnesota and half for the Twin Cities metro area. The remaining $400 million of the $1.7 billion bonding request will be used to absorb inflation costs and other project budget adjustments. The identified projects, which have been delayed or unfunded for years, were drawn from statewide long-term programming plans. The projects address congestion, provide capacity improvements, remove bottlenecks and improve statewide interregional corridors. Highway 67 begins at a junction with Hwy 75 in Yellow Medicine County, then runs due east into the Minnesota River Valley. At Granite Falls, the road dips and curves as it follows the river valley’s terrain. The highway begins a scenic descent toward the river, but its hills and curves limit drivers’ view of children waiting for school buses in a wooded area. Now, however, motorists get a warning when a school bus approaches the site. A radio transmitter mounted in the bus signals a receptor which triggers yellow, flashing lights placed about 1,000 feet from the bus stop. The solar-powered lights flash until the bus leaves. 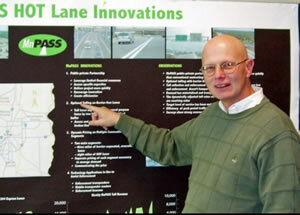 Mike Lownsbury, the Willmar District’s assistant traffic engineer, proposed using the technology to improve safety at the bus stop on Hwy 67 about four miles southeast of Granite Falls. The technology is not new, but it is the first time in the United States it has been adapted to alert drivers that they are approaching a school bus stop, Lownsbury said. Gabe Gubash, a project engineer with Traffic, Security and Operations who worked with District 8 on the project, said the project will be monitored to assess its performance. “This is a pilot project; we’ll see how well it works for possible use it in other locations,” he said. Traffic management tools used by the Regional Transportation Management Center in Roseville have been growing steadily over the past year, reports Todd Kramascz, RTMC operations supervisor. The latest improvement includes additional loop detectors and traffic management cameras installed along several stretches of metropolitan highways to help Twin Cities metro area motorists better manage their daily commutes. 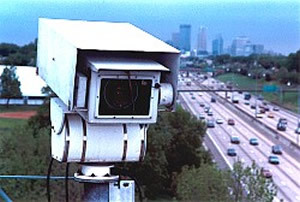 Sections where the new cameras have been installed include Interstate 494 in the southeast metro, Hwy 52 running from Dakota County into downtown St. Paul, and in and around the “Unweave the Weave” project at I-694 and I-35E in Little Canada and Vadnais Heights. There are other traveler information tools available through the traffic management Web site, www.dot.state.mn.us/tmc/trafficinfo/index.html. The site, which can also be accessed directly via the Mn/DOT home page, offers a dynamic, color-coded map that provides a real-time report on congestion throughout the day. During rush hours, motorists can see estimated freeway travel times for 26 segments on corridors around the Twin Cities area. Those reports coincide with the travel times posted on changeable message signs at various points on the metro freeway system. Motorists can also check a list of incidents from the RTMC to see if there is one on their route. The incident list gives time and place of the incident and indicates whether it is blocking a traffic lane. It also provides a traffic camera view of the incident. And, for motorists who have small mobile computing devices such as Blackberry communications equipment, there is also a mobile device site that presents a set of Web pages scaled down to fit on a small screen. Those pages can be found at www.dot.state.mn.us/tmc/trafficinfo/mobile/index.html. The RTMC Traveler Information Web site provides a wealth of valuable information to commuters. Here, the "Incidents" page is highlighted. Travel times, traffic maps and camera maps also are available on the site. Bob Jacobson’s co-workers respected his vision and passion for the environment, traits usually overshadowed, they said, by his innate modesty and self-deprecating sense of humor. 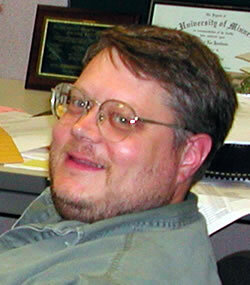 Jacobson died suddenly Jan. 23 at his home in St. Paul . He was 48. He served as a wetlands program supervisor with Environmental Services. At the time of his death, he was working with the Board of Water and Soil Resources on the management of statewide wetland mitigation projects. 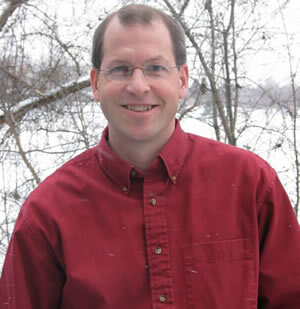 Jacobson joined Mn/DOT in 1989 after earning a bachelor’s degree in biology and a master’s degree in botany from the University of Minnesota. “Bob was a great co-worker who had a passion for what he did,” said Sarma Straumanis, a wetland program coordinator with Environmental Services who worked with Jacobson on the wetland development project with the state’s BWSR. Straumanis said Jacobson was involved in many vegetation restoration projects, from planning and design to construction, seeding and controlling invasive plant species. Jacobson earned state and national recognition for his advocacy of using native plants along roadsides to increase biodiversity, lower mowing and other maintenance costs and provide shelter for wildlife. “Bob was an innovative, out-of-the-box kind of guy,” said Carol Zoff, a landscape architect with the Office of Technical Support. She recalled his zeal for using native plants, working with other agencies and the University of Minnesota to support the program and its goals. Jacobson had a hands-on approach and partnered with many in the public and private sectors, including modifying a seed drill to plant the tiny seeds for native grasses and forbs. Rebecca Novak, District 7’s environmental coordinator, said Jacobson freely shared his knowledge about plants and the environment. “Bob came down for several field trips and helped us identify wetland options related to the Hwy 14 reconstruction projects, track rare plants such as valerian and identify native plants best-suited for wetlands or on roadsides,” she said. Frank Pafko, Environmental Services director, said Jacobson brought a unique set of skills to his work. Jacobson’s survivors include parents, Robert and Jean Jacobson of Minnetonka, and a brother, Ronald Jacobson of White Bear Lake. Lt. Gov. Carol Molnau has appointed Tim Henkel, currently transportation operations manager at the Metro District, as director of the Program Management Division, effective Feb. 7. Henkel succeeds Randy Halvorson who retired in November. As Program Management Division director, Henkel will be responsible for the statewide planning and programming elements of Mn/DOT’s multimodal investments, the development and application of performance measures and executive leadership for the offices of Aeronautics, Freight and Commercial Vehicles, Investment Management and Transit. Henkel has nearly 23 years of service with Mn/DOT and has served in many planning and leadership positions. Most recently at the Metro District, Henkel managed the district construction program/budget, the Twin Cities multi-agency planning and programming functions, and the passenger rail planning, design and construction functions. Henkel also has played a leadership role in a variety of regional, district, department and national committees and initiatives. Prior to joining Mn/DOT, Henkel worked in the private sector and in local government. He holds a bachelor’s degree in geography from Bemidji State University and is a graduate of the Dunwoody College of Technology–Civil Engineering and Land Surveying. Sometimes the best way to learn something is to teach it—or present it at the Transportation Research Board’s annual research conference. The annual conference enables participants to stay abreast of current developments and creates a forum to share research findings with their peers in the FHWA, other state DOTs, universities, transit agencies and the private sector. Staff from Mn/DOT did plenty of both teaching and learning during the week-long, day and night schedule of lectures, workshops and panel discussions. Mn/DOT staff presented reports, led panel discussions and learned about scores of innovative developments during the meeting held Jan. 21-25 in Washington, D.C.
TRB is a branch of the National Research Council, an independent adviser to the government on scientific and other questions of national importance. Department representatives also conducted “poster sessions”—displaying project information graphically and being on-hand to answer questions. Ken Buckeye, Office of Investment Management, presented a poster session on congestion pricing and the Interstate 394 Mn/PASS program. TRB participants were impressed, Buckeye said, by Mn/DOT’s ability to operate a toll system which is only partly separated by barriers. The system’s success, he said, is based on signage, variably priced tolls, effective enforcement and its ability to keep traffic moving in the 10-mile corridor between Minneapolis and Minnetonka. Buckeye, OIM value pricing and program manager, also participated in discussions of topics such as determining the actual costs of operating a car and basing road taxes and insurance rates on the amount of travel a vehicle does during each month. 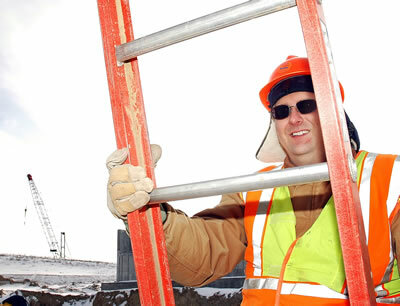 Gary Thompson, Construction and Innovative Contracting director, said he discovered that Mn/DOT is among the leading states using the design-build contracting process. “There was an emphasis on innovative construction methods, including public-private partnerships and design-build,” Thompson said. To learn more about presentations and other reports, check Minnesota ’s annual TRB guide at www.research.dot.state.mn.us/#feature. Mn/DOT might begin placing canisters of wolf urine along some state highways in an effort to reduce the number of deer-vehicle collisions. The idea was suggested during a multi-state conference focused on reducing the number of highway collisions involving deer. Bob Weinholzer, a program administrator with Traffic, Security and Operations, raised the possibility during the first meeting of transportation, safety and natural resources officials from Minnesota and six other states that have pooled funds for research on deer-vehicle collisions. 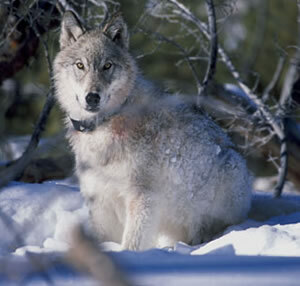 The urine or a synthetic compound could come from wolves, coyotes and bears, all deer predators. The meeting was held Jan. 30-31 at the Mn/DOT Training Center in Arden Hills. Crashes involving deer and vehicles are a growing national safety and economic issue. Insurance claims show that Pennsylvania and Michigan experience the largest number of crashes. Minnesota ranks sixth. Weinholzer said the crashes kill about 200 people each year and cost the traveling public more than $1 billion annually in property damage, injuries and deaths. In 2005, two people died and 474 injured by deer-vehicle crashes in Minnesota. The Department of Public Safety reported a total of 4,176 such crashes that year. Increasing urbanization, higher traffic levels and a growing state deer herd estimated at 1.3 million contribute to the number of crashes. Minnesota is among seven states that have pooled $280,000 in research funds for the study. While the newly formed technical advisory committee ponders the use of predators’ urine or other methods, Mn/DOT will test laser-triggered warning signs on a section of Hwy 23 near Camden State Park near Marshall. The lasers will be placed from 35 to 60 feet from the road. They will emit twin beams that only a large animal such as a deer would triggered. Once activated, flashing lights mounted on deer crossing signs will warn motorists to reduce their speed. Ten signs will be equipped with the laser-triggered lights. Weinholzer said between 40 and 80 deer are killed on that section of road each year. You’re a supervisor and have an employee who injured her back while on the job. The doctor says she’ll be able to return to work with restrictions in six weeks, but probably won’t be able to perform her previous duties as a heavy equipment operator. How do you handle this situation? What benefits and accommodations is the employee entitled to? Mn/DOT managers and supervisors are reviewing case studies like this one—and learning the answers—as part of the “What’s Up Doc?” training sponsored by the Risk Management Section in the Office of Civil Rights and Administrative Services. The required training for Central Office managers and supervisors is intended to educate them about state and federal laws and department policies affecting employees on leave because of illness or injury. The four-hour workshop covers the Family Medical Leave Act, workers’ compensation laws, the Americans with Disabilities Act and the state’s sick leave policy, according to Serge Phillips, Mn/DOT statewide workers’ compensation manager and one of the workshop’s instructors. “Accurate and timely reporting is key to successful administration of these processes,” he said. The training was first developed in 2005 to help clarify some of the confusion about the interrelationships of these processes. Besides the workers’ compensation area, presenters include experts in the areas of affirmative action, human resources and disabilities. Managers and supervisors have a choice of eight training sessions between now and June 28. Registration is online through the Mn/DOT Learning Center at http://ihub.lms/. Employees who want to share news about a retirement, health and wellness activity or community event, or find a new home for a pet or household item, can do so on the new Employee Bulletin Board. This newly revised board replaces the GroupWise Bulletin Board—but with a twist and some new requirements. Employees who wish to post an item on the board will now submit it through Mn/DOT’s iHUB site. Viewing the items listed on the board will remain on GroupWise. Kender says the newly revised version is streamlined to minimize the amount of time needed to maintain the service, and to better align it with Mn/DOT’s appropriate use policy. Employees posting information should carefully review the new procedures as there have been some changes—for example, no attachments are allowed, she said. “This is a great way for employees in all offices and districts to connect with each other,” Kender added. To send an item to the board, or the view instructions on how to proxy into to the board, check out the new iHUB site at: http://ihub/bulletin_board/index.html. Employees can view items by proxying into the EmployeeBulletinBoard GroupWise account. The oft-heard expression that Minnesota has two seasons—road repair and winter—may need revising. Lately, moderate winters and the press of deadlines to finish projects provide incentives for crews to work on major projects through the region’s coldest months. Working outside through the winter is not a new thing for Mn/DOT people. Decades ago, for example, maintenance workers shoveled sand and salt onto highways while standing in the beds of snowplow trucks. Survey crew members often used skis or snowshoes to get their work done, sometimes in very remote locations. Bridge crews repair bridges no matter what the weather. So do workers from the Electronic Services Section when traffic signals need repair or replacement. Now, however, the press to complete major projects such as Hwy 212 and the “Unweave the Weave” in the Twin Cities and Hwy 52 in Oronoco means that many project inspectors, supervisors and engineers are spending long winter days in the cold. They have warm site offices and pickup trucks for relief from the cold, but they still must spend many hours outdoors facing the wind and often bone-chilling temperatures. 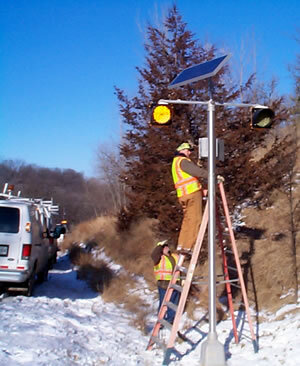 Mn/DOT issues directives about working in the cold. Jim Weiler, a safety administrator with the Metro District, said they include wearing appropriate clothing, taking breaks to avoid becoming chilled and checking on co-workers to make sure they are not fatigued by the cold. Construction work is different in winter, but much can be done in the coldest months, including installing steel reinforcing bars, building wooden forms and pouring concrete for piers, abutments and other bridge components, placing bridge beams and continuing pile-driving operations. Charles Cadenhead, a project engineer building the new section of Hwy 212, said concrete can be poured, for example, because the wooden forms are heated and covered with blankets. Batch plants use hot water when they mix concrete. As the concrete sets, a chemical reaction—hydration—creates heat energy that prevents it from cooling too fast and cracking. One aspect of construction that winter limits is grading and other earthwork because of the frost in the ground. Winter weather may also prohibit work due to the cold and wind. Jai Kalsy, manager of the Oronoco 52 project in District 6, said contractors’ employees will not work if the temperature falls below zero or if wind chill readings drop to five below zero. Still, a lot of work can be done during the winter. Duane Tennison, a Metro District inspector on the Hwy 212 project, said his biggest concern is the loss of efficiency associated with cold weather operations. In fact, he said that he finds it easier to work in winter’s cold than in the muddy conditions created by the spring thaw.